The subject property is located opposite the fishing village of Kampong Pasir Panjang, Pekan. There are a few islands there but this is one of the larger island. According to the locals here, there were people inhabiting the island long time ago. Another closer view, this time looking at the narrow end of the island. As can be seen here, the island is substantially higher than the sea water as compared to the numerous other nearby islands which is full of palm trees and not much solid land. 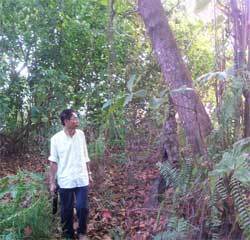 The island has a solid land with coconut trees and we even saw an old mango tree. 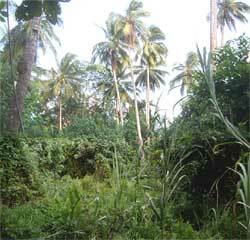 A another view of the many coconut trees on the island.